• Talk with Fans – See what people are saying about you and the topics you’re interested in. • Share Everywhere – Share updates across Facebook, Instagram and Twitter, all from one app. • Tell Your Story – Start conversations directly from your phone by posting updates, sharing photos or videos, or hosting a live Q&A. Live is the new feature that was added and celebs just started using this yesterday. You can comment on, like or share the video while watching a live broadcast. You can also see when your friends or other public figures start watching. Live is an immersive and authentic way to connect with the public figures you care about, in real-time. If you don’t catch the live broadcast, you can also watch the video later on the public figure’s Page. You can also embed the videos or the Facebook post in blog posts using the embed code. Guy Kawasaki tested out the Facebook Live video feature and had a great audience of people tune in. Trying Live, the new feature of Facebook Mentions. Guess I need to shave before going Live. I’m so lucky to have the Mentions app on my iPhone so you’ll be able to see my Live videos on my Facebook Page. The Mentions app works differently than the regular Facebook app in several ways aside from the special features above. It’s a hyper-targeted view of Facebook that allows you to focus on activity on your Facebook Page. You can see that the options for activities are at the bottom of the app: News Feed, Mentions, Post, Notifications, and Me. I love that the videos automatically upload to your Facebook Page and commenting while you’re live is much better than other live streaming services such as Periscope and Meerkat. I also like that the comments and conversations stay on your Facebook Page so you can catch missed comments or thank people for watching later. 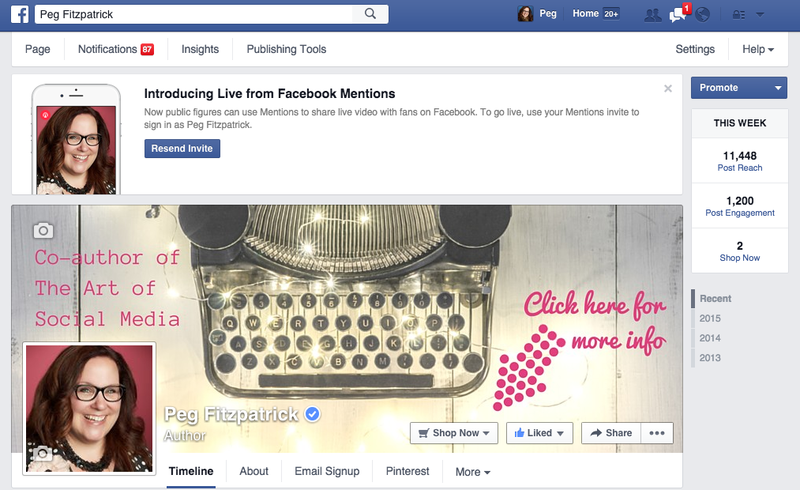 In Facebook Mentions you can share your story by posting updates, sharing photos or videos, or hosting a live Q&A. I host a live Facebook Q&A every Friday that I call my Thanks a Latte Q&A – people come and ask questions each week and it’s built a great community on my Facebook Page. Mentions is currently only available for people with verified Pages in the US. Facebook plans to roll out to more countries and verified Profiles in the coming months. If you’re eligible, you’ll see this at the top of your Facebook Page. If you are an admin of a verified Page, you can request access to Mentions directly. If you are a public figure, you can also download the iPhone app to request access. Live has all the elements of an exclusive event with the staying power and longevity of your Facebook video for your community members who missed it live. I can’t wait to see how this feature grows and expands in the future. What do you want to see on Facebook video from your favorite Facebook Pages? “If you are a public figure, you can also download the iPhone app to request access.” – it seems anyone can do this, as I am not a public figure and do not have a verified page and yet I am able to download the app and fill out the request to be verified for mentions. Hello Peg. Have you had any trouble with the video stream in Facebook. I was planning on using that feature to live stream part of an event where I’m DJing this week-end, but I’ve read comments about the feature being a bit unstable. You need good WiFi for it so make sure you have a WiFi connection – not cell signal so you don’t get interrupted. Good luck streaming from your event.